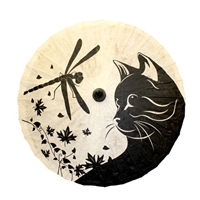 World Buyers has a wide variety of Wholesale Dragonfly related gift items for available to the Trade. Select from wholesale dragonfly paperweights, metal figurines, dragonfly garland and more. Assorted dozen clasp coin purses featuring lovely vintage dragonfly artwork. 1 dozen blue dragonfly hooks. Antiqued blue. Pretty mesh and glitter dragonflies appear to be flying nearby! Colors are soft and pleasing. Whimsical dragonflies in soft mesh and beautiful light green colors. Lovely assortment of dragonfly art grace these glass trays. Order increment is 1 (dz) 2 (dz) etc. Double-sided glass cabochon keyrings have pretty little dragonflies on both sides. Six different images with same blue dragonfly on the reverse side of each keyring. Gift boxed. Great price! Popular little dragonfly suncatcher with glass nuggets. Sometimes hard to find dragonfly decor is now at the ready with this colorful creature. Pretty shade of purple and sunset!